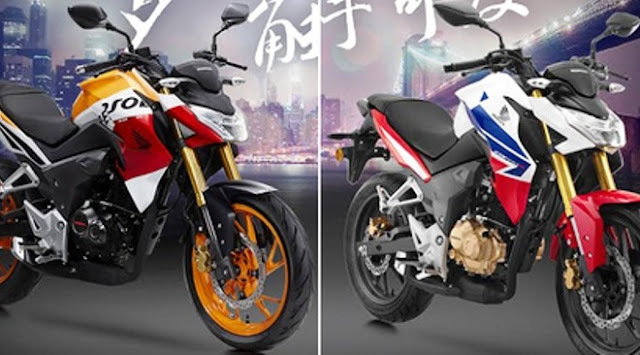 OtoSome- As of August 25, 2015, Honda CB190R and CBF190R has been officially launched by Honda China. Two sporty design which has become iconic Honda with a cool, new order, not only was uproar in a country that is the target of sales, but also in ground water. According to Honda of China, the presence of Honda CB190R and CBF190R an answer to the needs of the population Bamboo Curtain country that always wants to look handsome and comfortable when driving. This new product supporting all elements in terms of both technology and synergies in a work of art motor sport. Honda's all-out measures to hit the market was recorded strong in aroma unique style that is completely new to the concept of body curvature sharp and decisive, the typical Big Bike equally equipped with front suspension Up Side Down (USD). Even Honda China has put more kick performance with embedded kitchen runway PGM-FI SOHC 184cc air-cooled forcibly. This machine is claimed to be able to bring power up to 15.6 hp at 8,000 rpm and peak torque 15Nm at 7000 rpm rotation. Acceleration support entrusted to the gearbox 5-speed transmission. Although using a larger engine, Honda of China remain optimistic able to bring the figure CB190R and CBF190R as a naked bike that still fuel efficient. Honda.com explained by the official website that the secret lies in the efficacy of PGM-FI technology that they say will help in terms of acceleration and response so thin thrifty fuel compete with 150cc variant.